What Are the Ingredients Used in Pre-Workout Products? What Is the Difference Between Stim Pre-Workout vs Stim-Free Pre-Workout? What Are the Benefits of Pre-Workout Supplements? Who Can Benefit from Using a Pre-Workout Supplement? How Do I Take a Pre-Workout Supplement? Are There Any Side Effects of Pre-Workout Supplements? How Do I Pick a Good Pre-Workout Product? In order to help you find a good product we’ve researched & compared the best pre-workout supplements on the market right now. PreSeries BULK is a powerful pre-workout supplement developed specifically with bulking in mind. It is designed to help give you a boost of energy during your workouts. Like all Transparent Labs products, PreSeries Bulk contains NO colored dyes, unnecessary fillers, or harmful additives. It contains many powerful and effective ingredients, masterfully blended to produce results. Who makes it: PreSeries BULK is manufactured by Transparent Labs, one of the most honest and straightforward companies in the industry. Instead of using pseudoscience, marketing gimmicks and outrageous claims to sell their products, Transparent Labs relies on proven science and word-of-mouth advertising. All their products are designed with one goal in mind: to deliver the best results possible, without the use of any harmful additives, artificial sweeteners, or unnecessary fillers. And, as the name suggests, Transparent Labs is completely transparent with their formulas, listing the specific dosages of ALL ingredients used, alongside an explanation of how each ingredient can help you reach your goals. In short, Transparent Labs uses scientifically proven ingredients to create innovative, effective, and powerful fitness supplements – and they add one ingredient that is not often found in this industry: honesty. 4 Gauge is a unique formulation containing all natural ingredients to deliver a boost of clean energy during your workout, without the unwanted side effects – no jitters, no crashes, no itchy skin. Just clean and smooth power provided by 100% natural ingredients, low caffeine and no artificial sweeteners..
No unwanted side effects – Low caffeine content. Made in the USA, in cGMP and FDA approved facilities – manufactured under strict regulations, to ensure you receive the highest quality product. 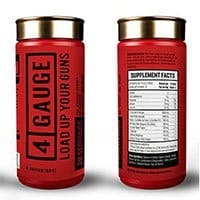 Who makes it: 4 Gauge comes from Roar Ambition, a premium sports supplements company based in the UK. They a select few high-end supplements, aimed at people who are looking for the latest formulations and the best quality available. Unlike some supplement brands, Roar Ambition are open about their ingredients, there’s no proprietary blends or hidden ingredients. They list every ingredient and the amount and tell you how it works. All completely safe to use, in the correct amounts and backed by studies. The downside about them is that they only sell direct online through their websites, so you can’t get them from Amazon or your local supplement shop. The company says that they do this to provide the best price and to provide direct customer support. 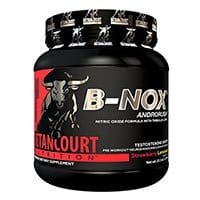 B-NOX Androrush is a unique and innovative product from Betancourt Nutrition. Using an advanced blend of traditional pre-workout ingredients such as beta-alanine and creatine, mixed with testosterone-boosting ingredients like tribulus and ZMA, B-NOX Androrush provides a balanced and complete pre-workout boost. It’s a very different type of product compared to most on this list, and will provide you with a whole new type of energy and drive at the gym. Because of the powerful ingredients used, it’s not the best choice for beginners, or for women concerned about the potential testosterone boost. Strength and Endurance blend, consisting of creatine (3 forms), beta-alanine, taurine, and more. Nitric Oxide blend, consisting of tyrosine, arginine, creatine AKG, beetroot, and more. Endocrine Ignition blend, consisting of zinc oxide, tribulus terrestris extract, horny goat weed extract, maca extract, and more. Neural Energy blend, consisting of caffeine anhydrous, tyrosine, and more. Anabolic Solidification blend, consisting of glutamine, valine, isoleucine and more. Who makes it: Andorush is made by Betancourt Nutrition, a relative newcomer to the sports nutrition industry. Founded by Jorge Betancourt, this company aims to create innovative products to help meet the growing demands of the fitness world. By combining traditional and proven ingredients with new and unique additions, Betancourt has introduced a whole new type of supplement to the industry. 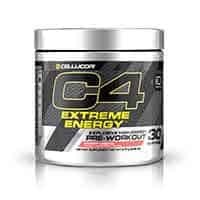 C4 Extreme Energy by Cellucor is the latest version of the popular C4 line of pre-workout products. It contains the same effective ingredients as the original C4. Its use of creatine nitrate instead of creatine monohydrate (which can cause bloating) may make it an even more impressive product. Who makes it: C4 is manufactured by Cellucor, a large-scale maker of exercise and nutrition supplements. Since 2002, Cellucor has been using proven effective ingredients, blended by industry professionals, to create some of the most powerful and effective products on the market. They are best known for their C4 line of pre-workout products. 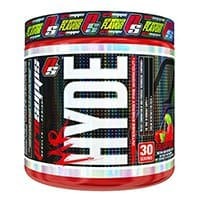 Mr. Hyde is an effective supplement designed to deliver extreme energy, pump and focus for your workout. Loaded with creatine, agmatine sulfate, powerful stimulants, and more, Mr. Hyde covers all the bases to provide a balanced, effective boost. 5,000mg Strength Matrix, consisting of beta alanine (2.5g), creatine hydrochloride (1g), L-leucine (500mg), agmatine sulfate (500mg), and L-citrulline malate (500mg). 419mg Caffeine Matrix, consisting of caffeine anhydrous (300mg), dicaffeine malate (69mg), and caffeine citrate (50mg). 154mg Intensity Matrix, consisting of Pikatropin (50mg), tyramine (50mg), hordenine (50mg) and yohimbe bark extract (2mg). Who makes it: Mr. Hyde is made by Pro Supps, a popular and rapidly growing exercise supplement company. Pro Supps develops all types of supplements, but their focus is on pre-workouts, with Mr. Hyde being their most popular product. Pro Supps uses scientifically proven ingredients and creative techniques to develop effective, affordable, and innovative products. 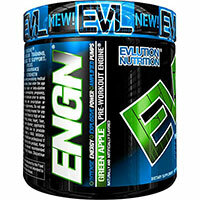 ENGN Pre-Workout is a unique fitness supplement made by Evlution Nutrition. It aims to provide its users with endurance, and delayed muscle fatigue – for longer, harder, more effective workouts. 2,000mg Creatine Complex, consisting of creatine monohydrate and magnesium creatine chelate. 2,213mg ENGN Mind-to-Muscle Matrix Proprietary Blend, consisting of betaine anhydrous, choline bitartrate, tyrosine, caffeine anhydrous, and more. Who makes it: ENGN pre-workout is manufactured by Evlution Nutrition, a new and rapidly growing exercise supplement company. Founded in 2013 by former BMX pro Mike Spinner, Evlution Nutrition’s stated goal is to help enhance the lives of their customers by giving them the tools they need to reach their fitness goals. 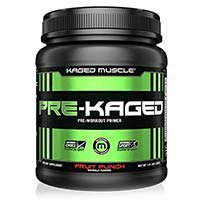 PRE-Kaged is a great pre-workout supplement made by a trusted company. This well-reviewed product features many beneficial ingredients, including caffeine, taurine, BCAAs, creatine, and more. With clearly listed doses for the included ingredients, Kaged Muscle steers clear of misleading proprietary blends and puts you in control of the supplements you are taking. It also has excellent user feedback. Who Makes It: Kaged Muscle is a sports nutrition company that focuses on creating high quality products for athletes and fitness enthusiasts. All their products are free of banned substances, and most use patented ingredients that are clinically studied. They also use third-party labs to test and verify the potency and purity of their products. 1.M.R. Vortex is formulated to enhance and intensify your workouts. It uses a blend of unique ingredients not found in most similar products. Who makes it: 1.M.R. 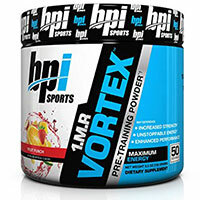 Vortex is made by BPI Sports, a small but quickly growing sports nutrition company founded in 2010. In their short time in the industry, BPI has quickly developed a following of loyal fans, who enjoy their unique and effective products. JYM Pre-JYM is an advanced pre-workout product designed to optimize your workout efforts. It uses an all-in-one formula that can help you improve your workouts and experience better results. 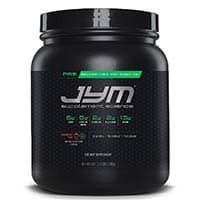 Who makes it: Pre-JYM is manufactured by JYM Supplement Science, a new and rapidly growing sports nutrition company. JYM is one of the few large supplement companies that is owned by a licensed PhD, Jim Stoppani. They use clinically proven ingredients at proven effective doses to make some of the most balanced and effective products on the market. 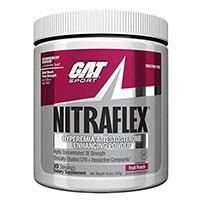 NITRAFLEX by GAT Sport is a high-intensity pre-workout cocktail that is designed to boost energy, strength and alertness during workouts. NITRAFLEX contains a vasoactive complex, to induce hyperamia, increasing blood flow to your muscles. The testosterone-boosting complex is designed to help you lift more and protect your muscles from catabolism. This product will help you to push harder and lift heavier than ever before. Who makes it: NITRAFLEX is made by GAT Sport, a company with over 20 years’ experience in the manufacture of nutritional supplements. All products are manufactured in the US, in top of the range, FDA inspected facilities. All products are also third-party tested to ensure their quality and effectiveness. To put things simply, a pre-workout supplement is a product you take shortly before exercising that helps maximize your workout. Whether you’re lifting at the gym, sparring in the ring, running at the park, or swimming in the pool, pre-workout products will help give you the edge you need to push yourself harder and achieve better results. Most of the time, pre-workout supplements are in powder form, and must be mixed with water, or another liquid of your choice. You can also find pre-made drinks, bars, and even pills that contain the same active ingredients found in the popular powders. There are pros and cons to each form of supplement, but in general the more effective pre-workouts come in powder form. Powdered products tend to absorb and digest faster, giving you a quick boost of energy and strength. There are a large number of different types of ingredients used in these products designed to boost your workout performance. Some individual supplements, such as creatine, can provide real benefits on their own, while most individual ingredients perform better when blended. Creatine is one of the most widely used supplements available. An organic acid found naturally in the body, creatine has been the subject of countless academic studies, and when it comes to increasing strength and weightlifting performance, the evidence is clear: creatine works (1). Creatine can help increase strength, power and endurance by replenishing your body’s natural supply of ATP, the main energy your body uses for muscle contractions (2). Creatine is often taken on its own, or as part of a pre-workout shake. Taurine is an amino acid found naturally in the body. It is used for a variety of physiological uses, including controlling muscle contractions and maintaining healthy fluid levels within the body. When you exercise, the body’s natural stores of taurine are depleted. Supplements containing taurine replenish the body’s supply, keeping muscles operating properly. Also, taurine combined with BCAAs has been shown to decrease post-workout muscle soreness (3). BCAAs, or branched-chain amino acids, help build muscle, provide energy and reduce muscle tissue breakdown (4). The 3 BCAAs are leucine, which has been shown to increase strength during workouts, isoleucine, which can help stimulate protein synthesis and aid metabolism during exercise, and valine, which stimulates muscle growth and increases endurance (5, 6). Beta-alanine is a building block of carnosine. It can help increase physical performance in the 60–240-second range (7). Carnosine helps to reduce neuromuscular fatigue, leading to increased endurance and increase lean mass (8). Note: beta-alanine can sometimes cause tingling of the skin. Citrulline malate is an amino acid which helps to optimize blood flow, increase ATP production, and reduce the effects of fatigue. Citrulline malate has been shown to help increase strength, aerobic performance, and muscle endurance. L-arginine is a similarly effective amino acid that is often used in place of citrulline malate (9). Tyrosine may potentially help reduce the effects of stress (both mental and physical stress) to increase mental focus and physical endurance (10). Caffeine is an ingredient we all know well. In supplement form, caffeine anhydrous is the most used type. Caffeine helps provide energy, while reducing the sensation of effort during exercise (11). As you know from reading the previous section, pre-workout supplements generally contain a blend of ingredients, ranging from BCAAs to taurine to creatine to caffeine and more. Although all pre-workouts use a blend of ingredients, there are two distinct categories of these products: stimulant-based, and stimulant-free. Stimulant-based, often just called “stim” pre-workouts, include stimulants such as caffeine, yohimbe and others. These tend to be the most popular, and often most effective blends. Stimulants give you energy to exercise harder and longer (caffeine is one of the most effective pre-workout boosters out there), and therefore products that include stimulants can be quite effective. Stimulant-free, often called “stim free” pre-workouts, use a blend of ingredients like creatine, BCAAs, etc. but do NOT include anything considered a stimulant. While these products can be slightly less effective due to the lack of an energy boost, they are still quite popular and useful. So, what’s better – Stim vs Stim-free pre-workouts? The answer to that question depends on your specific needs and wants. If you’re looking for the most intense boost to your workout, absolutely go with a stimulant based product. If you’re looking to avoid stimulants and caffeine, go with stim-free. Additionally, think about what time of the day you usually exercise. Caffeine can interfere with sleep patterns, so if you exercise in the late afternoon or evening, avoid stimulant-based pre-workouts (12). Pre-workouts are commonly used by weightlifters and athletes hoping to improve their workouts. Keep in mind that pre-workouts always contain a blend of ingredients, so effects may differ from product to product. Energy: Multiple ingredients included in many pre-workouts can boost energy and stamina. Caffeine, which is found in most pre-workouts may increase adrenaline and other catecholamines, and signal your liver to release sugar into your bloodstream for more energy – all of which can have an effect on energy levels (13). Caffeine has also been shown to reduce the sensation of effort during hard workouts, which adds to the perceived increase in energy levels (14). Strength: Some pre-workouts may actually temporarily boost your strength and endurance. This is largely due to creatine. In a study published in the Journal of Sports Science and Medicine, creatine was found to increase max performance and power by up to 15% (16). Creatine is particularly effective for “short-burst” energy, such as weightlifting, sprinting and racing (17). Other ingredients found in pre-workout supplements may also help to improve strength, such as leucine and other BCAAs (18). Endurance: Pre-workouts are designed to help boost your endurance. Branched chain amino acids (BCAAs) are a common ingredient in these products. BCAAs have been shown to reduce concentrations of fatigue substances in the body after prolonged exercise, leading to enhanced endurance and performance (19). This affect is twofold: reducing the fatigue substances such as serotonin helps to reduce muscle damage substances including CK and LDH. Other ingredients, such as beta alanine, can reduce neuromuscular fatigue which may also help to enhance endurance (20, 21). Recovery: While not the primary purpose of a pre-workout supplement, some ingredients can also help to speed recovery time. BCAAs combined with taurine have been shown to reduce symptoms of delayed-onset muscle soreness and muscle damage, and both of these ingredients are commonly found in pre-workout blends (22). Exercise performance: The underlying goal of pre-workout supplements is to enhance athletic performance. This goal is achieved by a number of key ingredients, including citrulline malate (which can enhance athletic anaerobic performance), creatine (which can enhance power by up to 15%), tyrosine (which can help to improve mental focus and endurance), and several other ingredients (23, 24, 25). Just about anyone who has a desire to exercise at max capacity can benefit from taking pre-workout supplements. Men – Most men have a desire to be strong and physically fit. While diet and exercise are important ingredients in the path to physical health, proper supplementation can greatly speed up the process. The top ranked products will provide the boost in energy, strength and endurance needed to build muscle and smash through fitness goals. Women – Women can also benefit greatly from taking supplements to boost their workouts. These supplements help to increase fat burning potential and endurance, which can lead to longer, more effective workouts. Bodybuilders, weightlifters, powerlifters, etc – This group will perhaps see the greatest benefit from taking a pre-workout. The average lifter already has a lot of muscle and strength, and as you get bigger and stronger, it becomes increasingly more difficult to make gains. When you reach the higher levels of fitness, you can often hit a wall that’s hard to get past. It’s called a training plateau, and anyone who has been bodybuilding for any significant amount of time has likely encountered one. Since pre-workout supplements are designed to give a short-term boost in energy and athletic performance, they’re best taken shortly before exercising. Generally, supplements should be consumed 20-45 minutes before exercise, although it varies depending on the product. Each product will have detailed instructions on how and when to take it. It’s very important that you follow dosing instructions. In fact, if you’re new to this type of supplement, you may want to start with a half dose to see how it affects you – especially if you are sensitive to stimulants. After a month or two of taking a specific product, your body may become adapted to the ingredients used, which can reduce the effectiveness of these supplements. Because of this effect, many people choose to cycle supplements by using them for 6-8 weeks, then taking a 2-3 week break. Pre-Workout Supplements are almost always in powder form, which means you will need to mix it with water in a shaker bottle. For the ultimate convenience, we recommend you use a BlenderBottle. They’re inexpensive and get the job done! Like any supplement you take, it’s important to know the potential side effects of using pre-workout supplements. Side effects vary depending on the product and the individual taking said product, although generally side effects are mild as long as the product dosage recommendations are followed. Many first-time users of pre-workout supplements will be surprised by a tingling sensation felt shortly after consuming the product. This is a very common side-effect. This tingling, called paresthesia, is caused by large doses of beta-alanine. It is a harmless side effect, and most people only notice it the first few times they take these supplements (26). Some users experience bloating when first using these supplements. This is largely attributed to creatine monohydrate, a powerful and effective ingredient found in most pre-workout products. Creatine causes the muscles to draw in extra water, which helps build and repair muscle faster. The bloating is caused by this extra water weight. This bloating is only temporary, and you will drop the water weight/bloat shortly after stopping creatine supplementation. For most people, this bloating is not an issue. For some women, the cosmetic downsides of bloating are an annoyance, which is why many products marketed as pre-workouts for women do not contain creatine. Dehydration can be caused by a number of ingredients found commonly in these supplements. Creatine can cause dehydration because it causes muscles to absorb more moisture, while caffeine and other stimulants can increase dehydration because of their diuretic effects. To combat the effects of dehydration, make sure you drink enough water. To combat this, simply allow enough time before consuming the supplement and going to bed (usually 2-3 hours) to allow the effects of caffeine to wear off. In other words, don’t use a pre-workout supplement for a late-night workout, or you might have trouble falling asleep. Some people experience stomach upset and/or diarrhea when first starting to take pre-workout supplements. Everyone reacts differently to the various ingredients used in these products, so it’s hard to narrow down a cause for this side effect. If you experience stomach upset after beginning a new supplement of any kind, it’s recommended to stop taking that product right away. Application to your goals – Ask yourself, does the product apply to your goals? If you’re looking to lift heavy and get shredded, you’ll want to find the a pre-workout for pump. If you’re looking to lose weight and get more toned, you should look for a pre-workout product for cutting. Quality of ingredients – Take a close look at the ingredient list of any product you are considering. Look at the type of ingredients they use, and the quality/sources of those ingredients. Brand recognition – Have you heard of the brand? Are they well respected in the industry? Generally, sticking to the well-known, reputable brands will lead you to the best products. Value for money – How much does the product cost per serving? How does that compare to the other products you’re considering? Be sure to compare on a per-serving basis instead of just looking at the package price of different products. Taste/mixability – You’ll want to find a good-tasting product that mixes well, so you’ll actually want to take it on a regular basis. The best way to find out how a product tastes is to read reviews. A lot of pre-workout reviews will contain detailed information about taste and mixability. Can you make it yourself – Did you know you can buy a lot of the ingredients in a pre-workout on their own and make your own drink. Here is our homemade pre-workout recipe.